Have you ever wondered what percentage of Alaska secondary schools sell candy in vending machines, school stores or snack bars? It’s 8%, down from 54% in 2002. Did you know that in 50% of schools, students take only one required health education course in grades 6-12? Did you know only 15% of secondary schools have a full-time registered nurse who provides health services to students? These important indicators of school health — and many more — are studied in the biennial School Health Profiles surveys, also called Profiles. The Profiles results provide valuable information to guide Alaska toward educating healthy, successful students. Healthy students do better academically. Healthy students have lower absenteeism rates, fewer behavioral issues, and higher graduation rates. The 2018 Profiles surveys are currently underway throughout Alaska in every school district and 239 secondary schools. Regular nationwide assessment of school health policies and practices is necessary to understand the school health landscape. 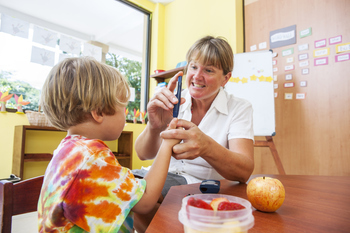 Survey results help identify successes in school health as well as areas for improvement. These results can inform decision-makers at both governmental and community agencies. The Profiles consist of two separate surveys, one for principals and one for health teachers. A minimum response rate of 70% must be achieved to ensure validity and reliability of the data. The survey results are completely anonymous. All school, school district and employee information is kept confidential. The final reports consist of combined statewide data and are posted both on the CDC Profiles website and the Alaska School Health Profiles website. Centers for Disease Control and Prevention. (2017). Health-Related Behaviors and Academic Achievement Among High School Students — United States, 2015. Morbidity and Mortality Weekly Report, 66 (35). "The Building Blocks of School Nursing"
"Alcohol and Opioid Use Disorders: Advances in Treatment and Recovery"